CERG builds on UEL’s strong commitment to civic engagement by focusing on the critical and public exploration of the complex economic, social and cultural factors that frame the everyday practices of people and the places in which they live. Places are complex and informed by multiple and diverse narratives and temporal forces. Despite an abundance of ‘information’, CERG explores the extent of public awareness and engagement with the development of policy making at a local, regional and national level, how this policy is underpinned intellectually, and the forces at play that impact it. This includes a critical examination of the tenets of neoliberalism and the current imperative for ‘economic growth’ that is often at the core of policy making and which has a real impact on people and places. The ‘sectors’ that the CERG engages in through an interdisciplinary approach include – Digital Cultures and Smart Cities, Creative Industries, Tourism/Heritage, Place and Identity, Education, Public Health and Food Cultures, and Design in the Public Realm. CERG engages directly with academics across-disciplines, local authorities, charities and not-for-profit organisations, government and directly with communities. In summary, our aim is for CERG to act as a conduit whereby academic expertise is identified and applied to solve ‘real-world’ problems. Recent inspiration for our project has arrived through the UPP Foundation Civic University Commission’s final report, Truly Civic: Strengthening the connection between universities and their places and its desire to remove “perverse measurements” that inhibit local civic engagement projects. The existing partnership between The Cultural Engine and UEL was established in 2014, when we adopted the nomenclature Club Critical Theory (see CCT video below) in order to facilitate an ongoing series of public-facing seminars in informal spaces outside of the university [pay]walls – a move we believed was urgently required given the often introspective character of much scholarly activity and changing nature of the “public” university model. In addition to our CCT seminars, we have successfully delivered a number of collaborative events, including: working with Focal Point Gallery (http://www.focalpoint.org.uk/events/180/) to deliver a workshop on food cultures and public health; Conway Hall (https://conwayhall.org.uk/event/space-and-propagation/) to discuss the role of art practice as a facilitator of public debate; and Southend Council (https://www.uel.ac.uk/Events/2016/9/Essex-Future-conference) to deliver a major two-day conference on place-making and the creative industries, entitled ‘Essex Futures’. The latter has been particularly important in shaping our future direction of travel. CERG’s research strategy is closely aligned to UEL’s commitment to be the leading university in London for civic engagement. The Group develops on The Cultural Engine’s track record of working with local authorities, government organisations, community groups, charities, think tanks, and funding bodies (e.g. heritage, arts and transport) to intervene and influence policy decisions. CERG will stimulate interdisciplinary and impactful research projects across the University, encouraging funding bids with non-academic collaborative partnerships and policy working groups. CERG’s public engagement, policy interventions and research outputs will contribute to UEL’s research environment. CERG will continue to develop a programme of visiting speakers through its CCT events. CERG will actively be engaged in curriculum development; recruitment of PhD students through this website; and use its collaborative partnership networks to provide engaging PG and research internship opportunities at UEL. To bring of CCT is to about a public engagement with the concept of critical theory – not as something that relates only to itself, but as something that can be considered and applied to public life. Something that is, in fact, useful (we can debate that). Whether we choose to believe it, or see it, we all see things from a theoretical perspective; we may not know what perspective(s) that is, or care. It is suggested (prior to rigorous testing through debate) that theory should be applied and not purely self-referential (this is of course an over simplification as much theory is applied over time). There are a lot of people out there who are critically aware, but how often does that thinking pervade the public life outside of universities, galleries and literature? This is not to challenge the importance of ‘critical spaces’, but this whole system could be considered exclusive. Perhaps the mass of theory should be pulling its weight more out there where we need it. Why do we need it? Should we not want more critically aware citizens in Southend? Is it right to expect people to look at their own attitudes to areas of public policy more critically? Would this not improve our interaction and perhaps influence on policy and keep our local and national politicians, community and business leaders on their toes? Not caring about what happens around us is still a decision. It is proposed that we gather together, on a regular basis, those who are interested in critical theory and its real world application. This, at least initially, is likely to be academics, artists and writers. This may be simply recreating the ‘exclusivity’ of the critical space, but it is a start. That can be discussed. 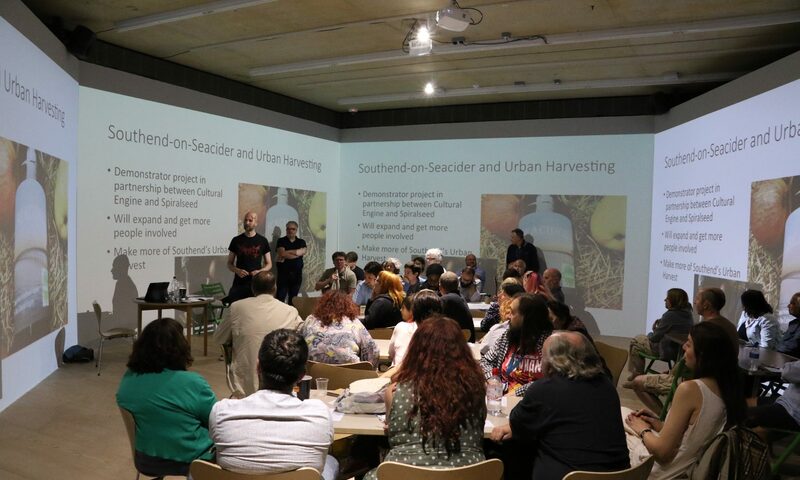 Creating a ‘critical space’ would involve people who are interested in explaining areas of critical theory that they think could/should have real world application, and then explaining how it might be useful to Southend in particular (but also other areas of the world). Focusing on Southend would perhaps challenge those taking part to think about applying critical theory to areas of public life that may impact (positively or negatively) on themselves, and people that they know (and other people). Applied theory – a challenge to everyone. It is proposed that a critical space – a space that specifically refers to itself as such – can only be beneficial for public life. The aim is to get critical theory out there…..There are no political aims, rather a proposal that more critically aware (or inclined) individuals are likely to engage in public issues more effectively (although it might do the opposite).